Blood-thinning medicines (also called anticoagulants) are used to prevent or treat blood clots. This page is about preventing or treating clots that develop in your veins, like deep vein thrombosis (DVT) and pulmonary embolism (PE). Blood-thinning medicines are also used to prevent blood clots that can form in your heart if you have atrial fibrillation, or after heart valve surgery. 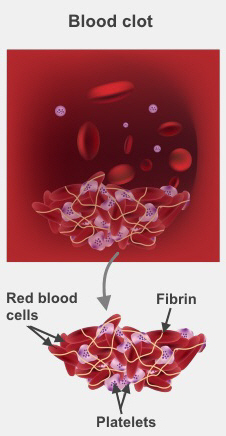 Blood clots are made up of red blood cells, proteins (including fibrin, which acts as a glue), and platelets, which are tiny cell fragments that help your blood to clot if you get cut. The medical term for thinning the blood is anticoagulation. Warfarin is the most common and widely used oral anticoagulant. What is blood thinning used for and how long will I use it for? Blood-thinning medicines greatly reduce the chance of a new clot forming, or of any existing clots from getting bigger. Different people need to use these medicines for different amounts of time. In particular it depends if there was an obvious reason why you had your clot, such as surgery or a long-haul flight. It also depends on whether you have had other clots before, and whether other members of your family have had clots. Some people take them for three to six months, some people need to take them for much longer. Talk to your doctor about the benefits and risks of these medicines, and how long you need to take them for. What are the risks of taking blood-thinning medicines? All medicines have some risks. If you take warfarin you may bruise and bleed more easily, because it will take longer for your blood to clot. It is possible you could develop serious bleeding in your gut, or even your brain, which causes a stroke. If you take warfarin, it is important to have regular blood tests to get your dose right. If your dose is too high, you may have bleeding problems, but if it is too low, it may not prevent or treat a clot. Warfarin can also interact with many different medicines and some foods, which can affect the dose you need. It's important you tell your doctor or pharmacist that you take blood-thinning medicines before you take any new pills, over-the-counter supplements, or herbal remedies. About one or two people in 100 will develop a serious side effect with warfarin each year. Everyone is different and the aim is to balance the benefits and risks of treatment for each person. Talk to your doctor about this. Doctors have good, long-term experience in using warfarin. There is an antidote or reversal agent, so if bleeding is a problem its blood-thinning effects can easily be reversed. There are some newer medicines that your doctor may recommend for you. These have some advantages and disadvantages over warfarin, and are not suitable for some people or conditions. Talk to your doctor about what is right for you. These are a group of newer blood-thinning medicines that you swallow (oral), different to warfarin. As they are new, we have less experience with them, but they seem to be as effective as warfarin. Their main advantage is that people taking these drugs do not need blood tests to monitor how well they are working. This means if you don't like having blood tests, live far away from a blood test centre, or travel a lot, they could be useful. Novel oral anticoagulants include dabigatran (Pradaxa), rivaroxaban (Xarelto), and apixaban (Eliquis). Dabigatran has a reversal agent that can be given to you in hospital if there is an emergency. It is important to know that if you start bleeding while on one of the other drugs, there is no known way of reversing their bleeding effect. Enoxaparin is an anticoagulant injection. It is generally only used as a temporary measure. For example many people get a small dose of Clexane when they are in hospital, as it reduces the chance of getting a deep vein thrombosis. It is sometimes used as the first treatment of blood clots while someone is building up to the right dose of warfarin. Written by HealthInfo clinical advisers. Endorsed by clinical director, Haematology, Canterbury DHB. Last reviewed March 2016.